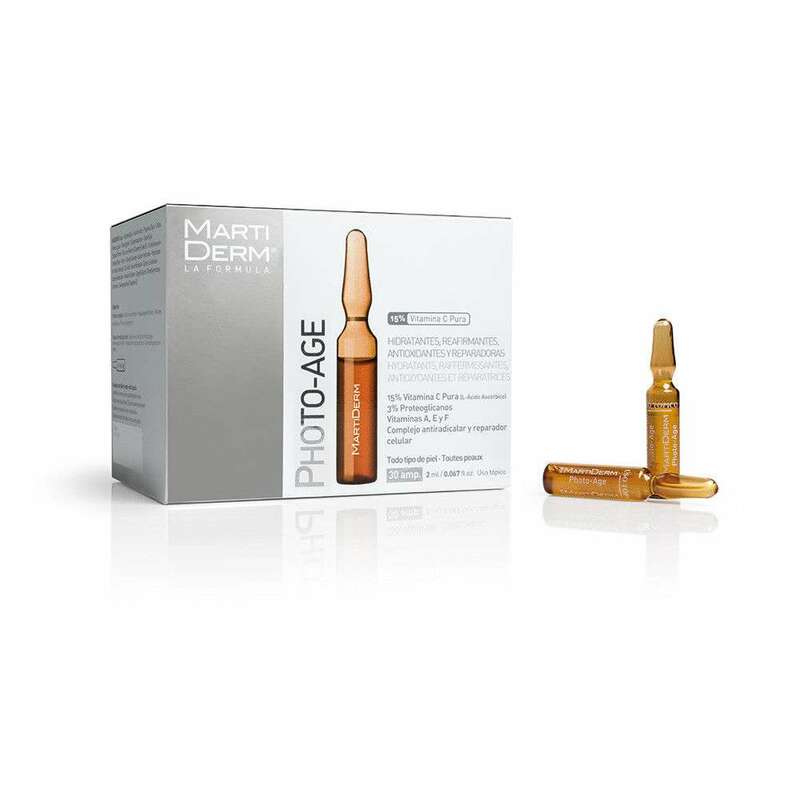 The Photo-Age ampoules are a must-have in your anti-ageing, youth restoring skincare routine. They contain 3% proteoglycans, 15% pure vitamin C and a complex that fights free radicals and repairs your skin. These ingredients work together to hydrate and firm up skin at the same time. In addition to having powerful antioxidant properties, pure vitamin C aids in the formation of collagen in the skin, which helps in slowing down ageing and the appearance of wrinkles. They are also a powerful ingredient in fighting blemishes, and helps to lighten dark spots, scars and unifies and brightens the skin tone. The name of the Photo-Age ampoules comes from the repairing, free radical-fighting complex in contains, helping us to eliminate the damage to our skin from solar radiation taking place day after day and accumulating in the skin. That is to say, it contributes to both treatment and prevention of damage from solar radiation, and with it, photo-ageing. There is a misconception that the Photo-Age ampoules are for people who have mature and photo-aged skin. However, since the ampoules are used for both treatment AND prevention, we recommend everyone to include it into their routine to maintain youthful skin. It is perfect especially since we live in a country with plenty of sunshine. In the case of skin with hyperpigmentation, this is an especially important step in your routine because integrated into a proper depigmentation treatment routine, the use of Photo-Age ampoules will greatly boost its effects. The method of use is as normal: apply ½ of the ampoule to the face, neck, and neckline in the morning and/or at night before applying your normal cream. The texture is that of an extremely light, dry oil that provides a pleasant sensation of comfort and is rapidly absorbed. What types of skin is it best for? With the exception of highly-reactive skin or skin that this sensitive to vitamin C (pure vitamin C content of 15%), they are designed for use on all types of skin: from dry to oily, including the full range of normal or mixed types of skin. Give the Photo-Age Ampoules a try today and see the dramatic difference in your skin!